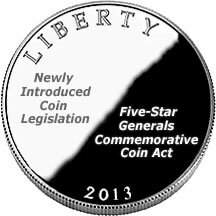 Congress ends the month with a flurry of rekindled coin legislation, as a new set of bills reintroduces the Five-Star Generals Commemorative Coin Act. Companion House and Senate bills, H.R. 1177 and S. 455, seek gold, silver and clad coins to honor five-star Generals and the United States Army Command and General Staff College (CGSC) for its service in educating the nation’s military leaders since its founding in 1881. 50-cent clad, $1 silver and $5 gold coins would portray Five-Star Generals George Marshall, Douglas MacArthur, Dwight Eisenhower, Henry "Hap" Arnold, and Omar Bradley — each alumni of the CGSC. If the act sounds familiar, it is. Sen. Pat Roberts of Kansas introduced a bill (S. 3456) with the same name on Sept. 9, 2008. Many bills fail to make it through a congressional session for one reason or another. These are automatically cleared from the books and must be reintroduced or die. Sen. Roberts, a former Marine, brought back the legislation in S. 455 on Monday. "I have visited the Command and General Staff College many times over the past 28 years as a Congressman and now a Senator," Senator Roberts said in a press release Tuesday. "This college on the banks of the Missouri River transforms the men and women of our country and those of numerous foreign nations around the world into first class planners, organizers and leaders who, with uncommon valor, fidelity and love of country have led the sons and daughters of their respective nations in the defense of liberty around the world." Fellow Kansas Sen. Sam Brownback is a cosponsor of the legislation. Rep. Dennis Moore and Rep. Lynn Jenkins, also from Kansas, introduced the House version, H.R. 1177, on Wednesday. With passage, the United States Mint would strike up to 100,000 $5 dollar gold coins, 500,000 $1 dollar silver coins, and 750,000 half-dollar copper-nickel clad coins for issuance in 2013. Respective surcharges of $35, $10, and $5 would be paid to the Command and General Staff College Foundation, a not for profit organization that is chartered to support the CGSC. Also reintroduced this week was legislation for commemorative Girl Scouts silver dollars and Mark Twain coins. For any bill to become law, it must pass both the House and the Senate, and get signed by the President.